Apparently I didn't react quickly enough to a complaint made in 2003. You have been damaging my career and business since 2003. It was nice of you to post my comments. But, I'm not guilty of medical fraud. If you do a search for John Allocca, ragbags is the fourth line. When people see that, they don't go any further. Your site has been listed here since September 1999. A Google search shows the Millenium Project page about you at position number eight, and two of the pages ahead of it are yours (at positions one and two). As your original complaint was in 2003 and you are still in business either you have a very resilient business or I haven't been doing any damage. Your comment that I appear to be a medical doctor at first, is your own bias. My title is medical research scientist. My biography specifies all of my degrees. You can call yourself whatever you like, but when giving medical advice, which you do, use of the prefix "Dr" suggests a degree in medicine. You do not appear to have a medical degree, so I am correct in saying that you present as a medical doctor but are not one. Your comment about a patent not proving anything is not correct. Maybe in Australia. But, in the US I had to submit clinic observations (small study) to the patent office. So how about clearing my name. Review www.allocca.com and if you have any questions about what I'm doing, please email me. Give me the opportunity to clear my name. john@allocca.com. 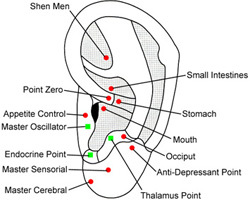 While ever your site suggests that there might be some validity to something as idiotic as ear acupuncture I think that all my questions have been answered. John A. Allocca, D.Sc., Ph.D.